I am a born and bred Newfoundlander. I was born on the west coast, lived in Labrador for many years and even longer in St. John's. I have always dreamed of owning a property on the Battery....one of the truly spectacular, unique areas in the world. This cottage will allow me to share this special place with old and new friends. So if you want to visit home, take that dream trip, explore an amazing place, Battery Bluff Cottage is for you. Outport Living in the City. Walk everywhere, sit on the deck and watch the boats come and go, walk the East Coast Trail from your doorstep, walk to downtown, eat, shop, tour and be merry. 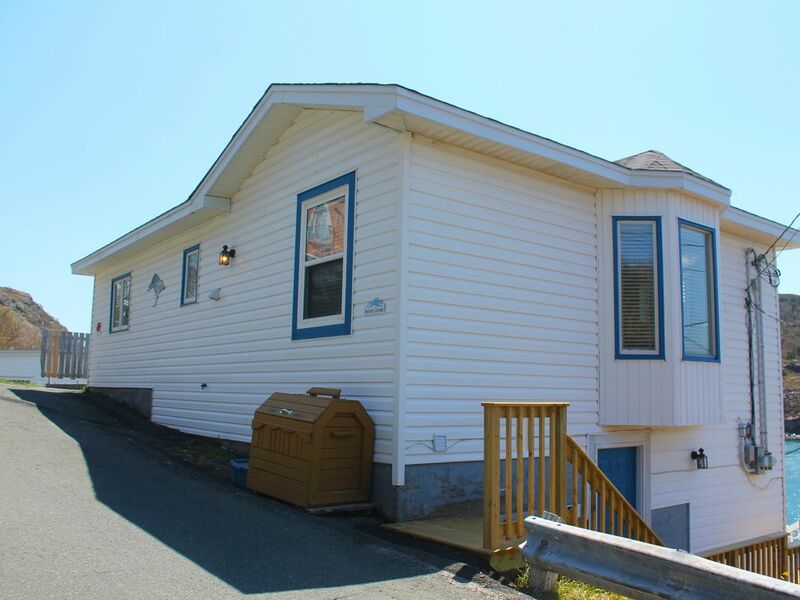 Suite A , fully equipped cottage, nestled in the cliffs overlooking St. John's harbour with panoramic views of the water, city and hillside.Steps to town, Signal Hill and the East Coast Trail. House Keeping Provided at the Beginning and End of Stay, If you require housekeeping in between, it can be arranged at an extra cost. Absolutely no deep frying food or open fat frying food....this is an extreme fire hazard. Check in is at 4:00 PM and Check Out is at 10:00 AM. Great area. Walk to downtown or hike up Signal Hill from your door. Cottage was roomy, clean and well equipped. Would love to stay there again. We walked almost everywhere we needed or wanted to go. And we so enjoyed overlooking the harbor. The home was more than adequate. We were very comfortable and the place very well maintained. Highly recommend. Thanks to Rochelle for making these 2 Texans happy. Everything was once again wonderful - location, amenities, and the view. We appreciated the coffee being provided (Tim’s!) and the laundry facilities. Loved looking out into the harbour. It was close to everything and yet far enough away to feel quiet at night. The cottage was neat and clean and well equipped. An easy walk to downtown and North Head Trail to Signal Hill. Loved watching all the activity on the docks. Perfection!! We would highly reccomend a stay here. We absolutely loved our ocean front cottage. It was clean, had everything we could every need & the view was stunning. It was a perfect home away from home and we were sad when we had to leave. The location was perfect too as it was walking distance to Signal Hill and a little further up was Quidi Vidi where the Brewery is and Mallards cottage. I’d highly recommend a visit. Walking distance too is the downtown. The fact that there was parking, a fully stocked kitchen, and a washer and dryer made our stay very comfortable. It was our first time to Nfld but not our last. When we come back we’ll definitely be staying here again. St. John's, Our Province's Capital, is the Perfect Combination of Big-city Luxury and Small-town Charm. As the Oldest and Most Easterly City in North America, This is Where Heritage Lives. Melded With Culture, History, and Personality, St. John's Has Survived Two World Wars, Five Centuries, Countless Hardships and Triumphs. It's Become a Rare, Old City Full of Character, Experience and Charisma, With a Contemporary, Sophisticated Edge. wander Down the Narrow, Criss-crossing Streets Carved by Horse and Carriage Over 100 Years Ago. Pass the Colourful Jellybean Row Houses Wedged Together in Every Space Lining the Sides of Steep Hills and Hidden Alleyways.battery Bluff Cottage is Situated On the Cliff Overlooking St' John's Harbour, Below Signal Hill and Beside the East Coast Trail. Once You've Meandered Down to the Working Harbour of the Waterfront, Look Towards the Narrows and Imagine a Time When the Waters Were Brimming Full With Fishing Schooners. visit Quidi Vidi, Our Charming Village-within-a-city, Which Still Embodies the Spirit of an Old Fishing Outport. Then, Hike Up Nearby Signal Hill Through the Famous Battery, ( Here You Will Find Our Cottage)where Tiny Wooden Homes Still Cling Valiantly to Cliffsides Ravaged by Ocean Waves. the Unmistakable, Iconic Cabot Tower Guards the Top of Signal Hill, Where Military Men Guarded Our Shores Throughout the 1700s and 1800s. Here, Marconi Famously Received His First Transmission Across the Atlantic in 1901. Look Out Over the Cliffs and Watch the City's Harbour and Captivating Skyline Spread Out Before You. Perched On the Top of the Horizon is the Rooms, Home to Our Provincial Museum, Art Gallery and Archives, Standing Next to the Striking Twin Clock Towers of the Basilica of St. John the Baptist. as You Explore the History of This Place, Shop at the Many Fine Boutiques, Shops, Cafés, Restaurants, Pubs, and Art Galleries Lining Our Streets. in the Evening, Sit Back, Relax, and Enjoy Live Music Or Local Theatre Where Actors Will Whisk You Away to Another Place and Time. for Nightlife Excitement, Head to the Famous George Street. Here, Clubs, Pubs, Bars, and Restaurants Are Stacked and Crammed. Every Evening, George Street Blazes With Energy, Especially During the George Street Festival – Five Days and Nights of Dynamic Musical Entertainment. for More Information On George Street and Upcoming Events On the Street Visit the George Street Association Website. st. John's, the Capital City of Newfoundland and Labrador, is the Most Easterly Point in North America, Located at the Beginning of the Trans-canada Highway Route 1, Just 3 Hours from Toronto, 4 from New York and 4.5 from London England.